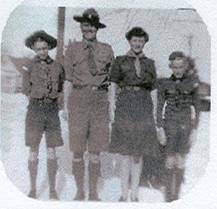 Muriel was the wife of former Field Commissioner and the first Camp Ranger J.C. Moore (47-70). Muriel supported the camp from its earliest days in a variety of necessary but generally unofficial roles. She was the mother of Don Moore (47-52) and Al Moore (47- 54) and great-grandmother of Council Field Executive Jeff Schaffhauser (99-03). 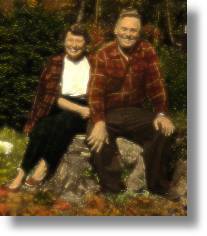 She died quietly in hospital in Leamington, Ontario on November 11, 2007. In the fall of 1989, Warner Clarke (66-70) andRod Ioi (65-70) visited Muriel and tape recorded her memories of JC, the early days at HSR and much of its history. The transcribed interview can be found at Mrs. M Remembers. It was a beautiful day to say goodbye. To say goodbye to the second half of one of the greatest teams of all time. It was a bright afternoon last Fall in West Toronto, when 30 plus people gathered around a gravesite and, with a peaceful grace, lowered Mrs. M. to rest beside J.C.
J.C. of course was the official one, who first scouted, and then recommended, the purchase of the Reserve. 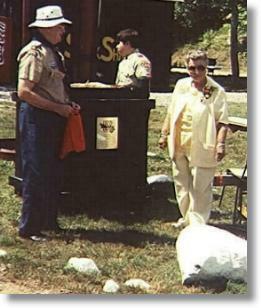 He then became the camp’s first Director and then Ranger. But never was he the true, sole Director and Ranger. He always had his powerful partner. As a team they developed the physical side of the camp; but more importantly, they developed the character, morals and values of literally thousands of youth. They led by example, by humour and by trust. And these leadership skills were quickly recognized and adapted by countless staff that were fortunate to have the opportunity to work and play with “The Team”. At the graveside their two sons were able to say a few words, both to help themselves and also to convey the pride they both felt for their parents. Then the next generation spoke, communicating the same feelings. Then the next generation did the same thing. What a legacy, when three generations can all proclaim love, pride and respect for two people! Just two people, who were given an opportunity, and used it to allow thousands to grow. After the family, a number of previous staff members were able to relate their experiences and the effect “The Team” had on their lives. I’ve purposefully not mentioned anyone’s name, choosing, rather, to have the focus remain with J.C. and Mrs. M. And the best way to maintain that focus and perpetuate a memorial of “The Team” is to continue developing youth, using their techniques of caring, example and respect.